The GreyCrow has landed!. Eligh's first solo album since 2003's Poltergeist. Five years ago, Eligh, the prolific beatsmith and emcee from the Living Legends crew, was wandering the streets of downtown Los Angeles searching for his next fix. After abusing drugs recreationally, he eventually dove deeper into a deadly addiction to heroin, threatening not only his life, but also his love for music. Turning down tours and worried for his own health and well being, he admitted himself into rehabilitation. With five years of clean living, Eligh hopes that his story of hope can help others through their troubles, whether it is a drug addiction, loss of a family member or losing yourself. Eligh, who refers to himself as, ''The Crow,'' says this album represents growth and wisdom acquired from his struggles over the past seven years -- struggles that morphed him into a more mature, Grey Crow. 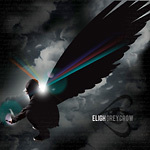 Eligh splashes the album with bright rays of hope, which are coalesced with dark drops into a rumbling low end, which grant the album a perfect mixture of dark and light elements. Please note: our current stock has the alternate cover art that was in the limited Grey Crow box sets (not the cover shown here). I'm not one to write a review, but I had to share my surprise with Eligh's newest album, Grey Crow. I have been listening to members of the Living Legends since the late 90's. I remember performances at Maritime Hall and other Bay Area venues (some which don't even exist anymore) when these guys were still just regular dudes in the underground scene. Like the rest of us, each has had had their individual journeys, struggles, failures, and successes. Collectively they still seem to get along alright, demonstrated by their continuous touring and performance schedules. In December 2010, in San Diego, at the How the Grouch Stole Christmas Tour, Eligh stole the show. Period. Hands down. No argument. And he killed it with, not his throwback stuff, but his new material that I (embarrassingly) hadn't yet heard. I told all my friends how dope the show was, showed them some video and eventually moved on with my life. When I noticed Eligh was coming with "friends" to play in Ocean Beach (San Diego) I suddenly remembered that I hadn't listened to the new album. I didn't even know what it was called. Yes, I realize I've fallen outta the hip hop game lately. I blame it on Jamaican Dancehall. So I got Eligh's album. I listened. It KILLED. It's DOPE. Again, no argument. And honestly, I admit, I was surprised it was so good. Really surprised. And super STOKED. This guy has done so much personally and professionally in the last decade that it's amazing he can still produce an album of this caliber. Whether or not he is widely recognized for his success, he is successful. Especially demonstrated in this album, Grey Crow. Oh, and by the way, Eligh rocked that show in OB alongside Lucky and Scarub. Go support your "local" artists. What an amazing album. Eligh never fails to disappoint. His sound progression over the years has been phenomenal and this album is no exception. Its quickly becoming one of my favorite Cd's. This record is an absolute must-have if you are a fan of anyone in The Living Legends Crew. As for the album, it is absolutely phenomenal. I haven't taken it out of my stereo since it came out. Definitely buy this album. I dont think eligh should experiemnt with drugs because his sound aint any better and its just gotten weaker. an instant classic from a very talented artist. Just went on eligh's myspace page and heard a few tracks with lyrics and the rest of the instrumentals. This is gonna be the best album of the year... by far.